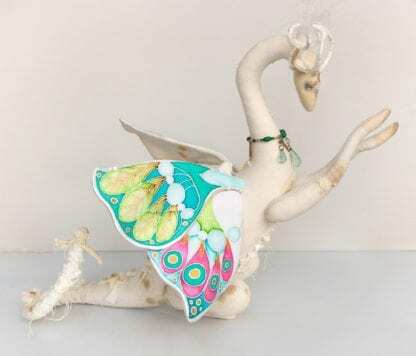 Flower Butterfly Dragon will be created to order just for you. I make my magical butterfly creatures totally by hand. All materials are high quality and safe. Each toy is absolutely unique. Wings are made of satin which hand painted with cold batik technique . They are movable and you can fix them in any position. I use paints and hands, so you can choose any colors and drawing theme you love. I also suggest vanilla or cappuccino body color. Body is made of heavy cotton and hand dyed with real coffee and cinnamon. Toy is filled with hollowfiber. Paws are connected with the body with metal cotter pins. They are rotatable in 360 degrees. Dragon is wearing a lovely enchanted necklace. If you’d like replace it with something else please welcome with any wishes. Also I can embroider few words on the body.